From the beginning of the Achaemenid Empire in the sixth century B.C. to present day Iran under the strict rule of Shiite Islamic clerics, this beautiful and ancient culture has experienced periods of intense wealth and great loss. Despite the many invasions by Greeks, Turks, Mongols, and Arabics, the Persian people were able to retain their rich cultural heritage. Unavoidably, lasting impressions from these invading cultures have left their mark in Persian society. The modern Persian language is itself a product of the Islamic Arabic conquest of Persia in the seventh cen­tury. It has adopted many Arabic alphabetical letters, words and names. At its greatest pinnacle in the Sassanian empire (third to seventh centuries B.C. ), Persia extended from Egypt eastward to the Indus River in present-day Pakistan and from Syria into Central Asia. Persia was surrounded by the Romans to the west, the Huns in the northeast, and violent tribes in the north. What remains of the mighty Persian Empire can be found only in the present-day country of Iran. The classical music of the Persian culture reflects the deep sadness of brutal invasions, the complex beauty of nature, and fusion with a higher power of existence. Persian classical music has evolved as a fluid expression of the social and cultural values proudly embodied by the Persian people, as demonstrated by the musical theory system, the role of music in Persian culture, and the creation process of musical performance. The history of Persian classical music is believed to date back to the very beginnings of the Persian Empire in sixth century B.C. ; however, very little documentation of this early art is available. Since Persian classical music is improvised and traditionally learned by ear or rote, there was no need for musical notation. Music was essentially passed down through the centuries by way of the relationship between student and ‘master’ or teacher. The first evidence of Persian music can be found in the writings of ancient Greek historians, which provide evidence for the musical interchange between Greek and Persian music during the Graeco-Persian wars. From the following Sassanian period (226-642 AD), the first evidence of musicians, musical activities, and instrumental descriptions are available. At this time, Persian music and musicians such as the famous virtuoso Barbod enjoyed an exalted status in the magnificent court palaces. Music at this time was mostly performed for royalty and was primarily performed as an accompaniment to Persian poetry. With the foundational establishment of Islam as the national religion of Persia in the seventh century, a sig­nificant fusion of Arabic and Persian music took place, including instruments, musi­cal terminology, and theoretical principles. As opposed to Persia’s former national religion of Zoroastrianism, Islam regards the arts and most forms of musical performance as sinful. Music lost its social approval and became an illegal public act except in the cases of weddings and private gatherings. This sudden change in the outlook of the musical arts caused drastic changes in the development of Persian classical music. The musical scene was forced to go underground in seclusion. Although the social status of musicians decreased, musicians were still employed by wealthy, upper-class families to perform music in the secrecy of their homes for private gatherings or parties. By reducing the public practice of music, Islam transformed Persian music into a metaphysical and mysti­cal art that raised it to the highest spiritual level. During the ensuing cruel Turk-Mongol conquest (13th to 15th centu­ries), the great amount of murder and destruction committed against the Persian people provided the motivation for the great Sufi and Dervish mystic orders which viewed music as the most direct path to truth. The beautiful poetic verses written by famous Sufi poets such as Mevlana Jalaluddin Rumi express the serious and intricate emotional character of the Persian people. From the beginning of the Persian Empire, Persian classical music and Persian poetry formed an organic relationship with one another, providing support­ing and purposeful expression to the complex topics of loss, beauty, nature, and love. Persian classical music is organized into twelve ton­al systems called dastgah, meaning organizational system in Persian. In the past, the dastgah concept has been compared to the Western mode and each dastgah has been character­ized with a specific scale; however, the musical concept in Persian classical music is much more complex than a seven-note scale with specific intervals between adjacent tones. Each dastgah embodies its own special repertory of melodies called gusheh-ha (singular gusheh) which are all typically modally independent from one another. In order to tie the various gusheh-ha of a dastgah together, the forud is used. The forud is a melodic cadence that concludes each gusheh and unifies the dastgah as a whole. There is also almost always an introductory section of a dastgah, in addition to the gusheh-ha, called the daramad which “characterizes the dastgah to the listener and musician, contains one principal motif that occurs frequently in performance and at various times at the endings of other gushes, and emphasizes the tonal environment of the tonic.” In essence, the daramad is the most representative portion of a dastgah. The forud concluding each gusheh of a dastgah shows the overall “dependence on the original mode intro­duced in the daramad section of the dastgah.” The daramad and the gusheh-ha of a particular dastgah collectively form the backbone of that dastgah tonal system. The radif of Persian music is essentially Persian music in its entirety: the pieces that compose the repertoire of Persian classical music. During the twentieth century, numerous theories have been proposed concerning the division of Persian inter­vals, specifically on the classification of the famous middle-eastern microtone. The sudden appeal for this explanation in the twentieth century came as a result of Westernization and the spread of European music around the world, including in Iran. After being exposed to Western classical music, many Persian musicians felt a need for mathematical classifica­tion of the microtone in order to ‘raise the credibility’ of Persian classical music. The significant debate over Persian intervals and a Persian scale demonstrates the social values of the Persian people. During the 20th century, when a great deal of westernization and modernization took place in Iran, there was an apparent social and cultural affinity to make traditional Persian life synchronized with the exciting developments of the Western countries. One of the theories on Persian intervals, proposed by Ali Naqi Vaziri, makes use of measured quarter tones in defining a 24-quarter tone scale which is essentially a further division of the western equidis­tant chromatic 12-note scale. Another theory, proposed by Mehdi Barkesli, attempts to give a highly scientific explana­tion of the Persian scale using mathematical measurements of Pythagorean intervals. 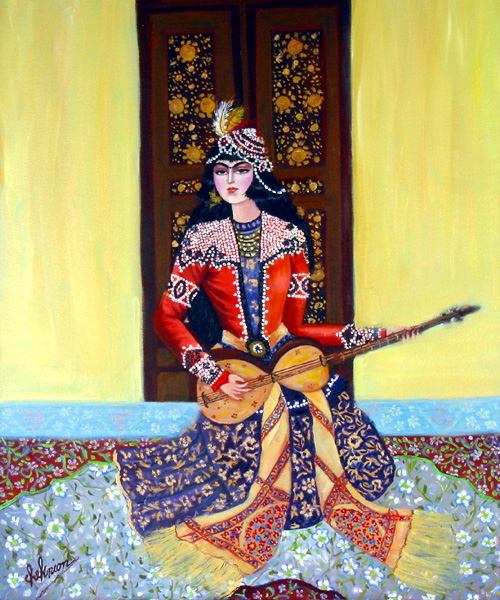 Although neither of these theories accurately describes the Persian musical tradition, the impact of Western concepts on the classification of Persian music is apparent. A third major, more recent, and more accurate theory has been developed by Hormoz Farhat. Mr. Farhat’s theory, titled “The Theory of Flexible Intervals,” rests on the belief that any notion of scale or specific interval measure­ment is completely irrelevant to Persian classical music. Mr. Farhat only goes as far as defining 5 types of intervals found in Persian classical music: the semi-tone or minor 2nd, the small and large neutral tones (intervals larger than semi-tone but smaller than whole-tone), the whole-tone or major 2nd, and the plus-tone (larger than whole-tone but smaller than augmented-tone). Beyond these classifications, this theory respects the uniqueness of each interval according to each performer and performance. Of all three theories presented, the theory of flexible intervals best captures the core inten­tion of Persian classical music: allowing the innate creation process of the musician to encourage the inspiration of every individual performance. True Persian classical music is not the melody col­lection of the dastgah tonal systems. The individual gusheh-ha and characteristic melodic pieces that are learned by all students of Persian music are never literally performed. Instead, they serve as a basic framework for the true creation process of the musician: improvisation. Although the impro­visatory technique rests on the spontaneous expression of a skilled musician, there are specific decisions and guidelines that a musician must choose before a performance. The first decision is deciding which dastgah to play from. The radif of Persian music is set to verses of poetry written by poets such as Rumi, Sa’adi, and Hafez. In fact, it is the meter of the poetry that gives rhythmic shape to most unmeasured Persian musical works. Therefore, poetic significance plays a crucial role in determining which dastgah to perform. The musician then must decide how many gusheh-ha of the chosen dastgah to perform and in what order they will be organized. Again, poetry may play an important role in this decision. Typically, the order of the gusheh-ha is based upon a curve shape in range, beginning with the daramad in the lowest part of the dastgah’s range, gradually rising to a high point, and then falling back down in range toward the forud ending of the piece. In addition to these preliminary decisions, the musician must also predetermine methods for the expansion and embellishment of the gusheh/dastgah backbone. The fine degree of intricate embellishment and ornamentation in Persian classical music is a characteristic found in all Persian arts including architecture, metal work, rug-making, and calligraphy. Differing greatly from the Western classical music tradition, the Persian classical musician is simultaneously composer, performer, and creator. The fixed elements of a gusheh that are present in all performances of a specific gusheh include “the location and configuration of the tetra­chord, the melodic function of each scale degree, the melodic shape, and characteristic cadence formulae.” The elements of a gusheh that vary according to time and musician con­sist of “elaborations and extensions on the basic melodic framework of the gusheh…repetition and varied repetition, ornamentation, and centonization, or the joining together of familiar motives to produce longer melodies.” As recently as the late twentieth century, selection of a dastgah and even specific gusheh-ha for performance were based upon the time and hour of the day. This practice was highly tied to religious beliefs and Persian cultural values of peaceful co­existence with the natural world. However, in recent years, the musician has been free to choose any desired dastgah for performance, usually targeted for a specific radio or televi­sion audience. Once these choices have been made ahead of time, the actual performance and ultimate creation of the music takes place. The most powerful and desired aspect of performance is when a musician is able to attain a state of hal, the “intense state of the soul…the interior fire which must animate the artist…the creativity gushes forth…the very essence of the music manifests itself.” In the typical ensemble of Persian classical music consisting of an instru­mentalist, a vocalist, and possibly a drummer, the singer is the designated leader of the ensemble and the instrumental­ists surrender some of their musical freedom to the singer. As previously stated, westernization has had a tremendous impact on Iranian society, Iranian people, and ancient cultural values. The result of musical westernization in Iran is best seen in the capital city of Tehran, the cultural center of the country. The Tehran Symphony’s full concert season of Western classi­cal music, a classical bal­let company, and Western opera performances are several examples of this drastic societal change. The establishment of Western musi­cal conservatories directed by French musical directors in the 20th century expanded the knowledge of Persian musi­cians in Western music theory, practice, and performance. Although music conservatories in Iran teach both Persian and Western classical music, Persian classical music has become a minority in the cultural scene. After being exposed to the harmonic organization, rhythmic control, and precise modal classifications within Western music, Persian musi­cians in the beginning of the 20th century began to desire the westernization of musical thought. A sudden preoccupation with the musical theory of Persian classical music caused the widespread use of Western notation in traditional Persian music. In order to accomplish notation of the microtone, the accidentals koron, signifying the flattening of a pitch by a microtone, and sori, signifying the raising of a pitch by a microtone, were devised by the first Persian to seek a musi­cal education in Europe, Ali Naqi Vaziri. Mr. Vaziri was also one of the first musicians to notate Persian musical pieces by applying Western harmonization to the Persian radif. The impact of notation on Persian classical music is best demonstrated in teaching. The modern method of learning a musical art is based upon the relationship between student and a master teacher. The student of Persian music studies to master his teacher’s radif until they are able to improvise by interpreting its melodic sequences. In ancient times however, each Persian musician developed their own version of the radif. Notation makes fast learning of the ra­dif possible. Many musicians from the ancient mystic orders in Persia believed that the mastering of the radif should take years and that skill perfection for the highest level interpreta­tion of the radif should be an ongoing experience throughout the person’s lifetime. Performance of Persian classical music has also been greatly affected by western­ization and modernization. Before the 20th century, Persian classical music was rarely performed for public entertainment due to Islamic disapprobation. Relaxed social conditions, increas­ing state support for the arts, and westernization in the 20th century have manifested in a growth of all musical activities in Iran. Persian classical music is now performed by both traditional instruments and western instruments such as the violin and the piano. The use of these Western instruments has caused changes in musical style and instrumental tuning, while placing increasing value on virtuosity of the performer. Western performance aspects, such as the printing of concert programs and standardization of a 90-minute time length for a concert have become widely used in the performance of Persian classical music. Technology has allowed Per­sian classical music to reach a more widespread audience; however, it has also created new performance traditions and permanent changes in musical program structure. Radio has had the effects of shortening performances, imposing a certain degree of standardization on Persian classical music performances, and creating a ‘star system’ which enables certain performers to attain widespread popularity over other performers not heard on the radio. Persian identity is deeply embedded in the ancient tradition of Persian classical music. Hormoz Farhat, The Dastgāh Concept in Persian Music (Cambridge, NY: Cambridge University Press, 1990), 7–18, 20–21. Loyd Clifton Miller, Music and Song in Persia: The Art of vāz (Salt Lake City, UT: The University of Utah Press, 1999), 6. Ibid, 13–17. 21-22. Bruno Nettl, Radif of Persian Music (Champaign, IL: Elephant & Cat, 1992), 19. Farhat, op. cit., 25. Ibid, 21. Bruno Nettl, “Persian Classical Music in Tehran: The Processes of Change,” in Eight Urban Musical Cultures (Chicago, IL: University of Illinois Press, 1978), 157–167. This entry was posted on Thursday, June 26th, 2014 at 21:53	and tagged with Classic Music of Persia, Music of Iran and posted in The Music of Persia. You can follow any responses to this entry through the RSS 2.0 feed.